Bump. Surprised at the lack of interest to date. It's listed in the for sale forum. Thanks for the feedback ! 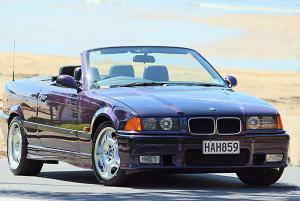 Reluctantly selling my low miles manual E36 M3 convertible. It's a bit special having done only 32000 miles (51kms - NZ new), in great condition and i'm only the 4th private owner ( plus 4 or 5 dealers). I have the wind deflector which fits in the back over the rear seats and works quite well with the top down. Recently valeted along with a coating of Feynlab Ceramic paint protection - the paintwork looks almost like new ! ( apart from a few chips and the bottom of the front spoiler, which i may get painted). It has a newer Sony CD player in it but i have the original one. The service history is all up to date in the handbook. In my 5 years i've had the air-con re-gassed, a new battery, new tyres, regular servicing and a very minor repair to a cable in the roof. The photos mostly date back a few years as she has been stuck under a cover in the garage while we work on a new driveway but i will try to get some more soon. $26,500 ono. First registered in Nz In 94 new but speedo in miles. E36 M3 tyre suggestions ? Not a lot of choices no oddly. There are a few Eagle F1s around still so thats a maybe as they are on the back at present but/and are the ones that need changing. There are a few other choices, the Falken 453's or 452's, the Toyo T1R Proxes or the Nexen NFera SU1, Maxxis MAZ3 i dont know too much about - . The 235/45/17 is too big a jump i believe thanks. I'm interested in the deflector, Can you get a shipping cost to Blenheim thanks ? Cheers. E36 M3 service in Marlborough / Nelson ? Any more ideas or suggestions thanks ? I've had my '94 E36 M3 for 6-7 months now and only done a couple of thousand kms but its probably due for an oil change and basic service and checkover - can anyone suggest a good and/or reputable place to go for a service in Marlborough / Nelson. Dont Really want to have to go down to Chch or over to Wgtn but will if i have to as i dont want to end up with the wrong oil or have a problem missed either ! Was driving through a longish tunnel near the City of London many years ago with the sunroof open and was passed by the roar of a V12 and flat 12 of a Lamborghini and Ferrari having their own little race. Still remember the glorious sounds ! Switch replaced and all fixed. Ended up taking it to the local auto electrician ( who was very familiar with the problem ) after spending to much time upside down in the footwell trying to sort it myself.....too tall and a bit to inflexible.